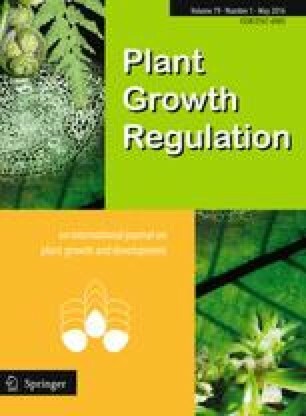 The effects of 35, 70 and 100 µmol m−2 s−1 photosynthetic photon flux density (PPFD) were investigated on ex vitro acclimatization of micropropagated Dieffenbachia plants. Various growth characteristics, photosynthetic parameters and activities of antioxidant enzymes and dehydrins (DHN) were investigated. Fresh and dry plant biomass, plant height and root length were highest under the highest PPFD (100 µmol m−2 s−1), but this treatment was responsible for a reduction in the number of leaves. Chlorophyll and carotenoid contents and net photosynthesis were also optimal in plants grown under the highest irradiance. Stomatal resistance, transpiration rate and F v/F m values decreased with the incremental light irradiance. Activities of the antioxidant enzymes superoxide dismutase, catalase and glutathione peroxidase were higher in the plants treated with 70 and 100 µmol m−2 s−1 PPFD. Accumulation of 55 kDa, 40 and 22 kDa DHN was observed in all light treatments. These results depict that lower PPFD (35 µmol m−2 s−1) was suitable for acclimatization of Dieffenbachia plants. High PPFD (>70 µmol m−2 s−1) induced accumulation of antioxidants and accumulation of DHN in the plants which reveals enhanced stress levels. This project was supported by King Saud University, Deanship of Scientific Research, College of Food & Agriculture Sciences, Agriculture Research Center. We would like to thank Prof. Timothy J. Close (Riverside University) for providing K-segment consensus peptide. We are also grateful to Angela Harrop (Plymouth University) for technical help.